These streets are growing thick with map-toting, camera slinging summertime guests. Time, then, for ArmeniaNow to give you something to live by, when the easy living brings you to Armenia. And maybe something to feed your temptation for a visit, if it’s somewhere in your thoughts. The ArmeniaNow Tourism 2007 is our fifth yearly special edition for visitors and those who want to be. This one is our most user-friendly yet, packed with specific info that will tell you where to go, how to get there, what to see and, when possible, how much it will cost. How much easier could we make your vacationing life? This week’s edition, Tourism 2007 Part I, highlights (dissects might be a better word) the capital, Yerevan. On July 20, Part II will take you outside the capital to scenic regional attractions. Both editions include hands-on travel information, sprinkled with a few essays and commentaries. 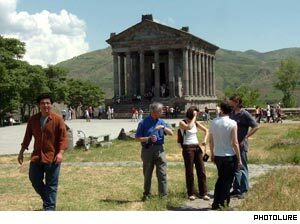 Tourism 2007, you’ll see, is a collaborative effort, produced in partnership with Tour Armenia. About the latter: Simply, Tour Armenia is Rick Ney. Simply, Rick Ney is . . . Well, that isn’t so simple. 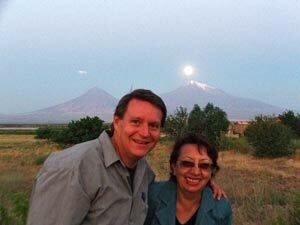 Rick first came to Armenia in 1992 to work at the American University of Armenia. In 1993 he began his work in humanitarian aid and development for USAID-funded projects at the Armenian Assembly of America and Fund for Democracy and Development, the latter as Caucasus Region Director. This morphed into writing about Armenia for various publications, which became the first English language complete guides to Armenia in 1997 (online) and 1998 (CD-ROM). Rick is passionate about Armenia’s deep history and ecology, and making the country accessible for independent travelers, whom he believes will be the basis of Armenia’s entry into the open world. In 2000 he began dividing his time between Armenia and caring for a parent in Texas, both of which he considers the richest experiences of his life. Rick is an Armen-o-phile. Before most of the non “ian” world had heard of Armenia, Rick – a Texan of all things – had already created a website (circa 1997) loaded with tourism information. I met Rick in 1996. He was working on a “travel guide”. It is 11 years later. The “travel guide” has become an encyclopedia. The Texan has written a book that is over 1000 pages and grows every time he sees something new – mapped and illustrated by his colleague Rafael Torossyan and translated when necessary by Bella Karapetyan. If he can be forced to stop collecting information, the book – TourArmenia, or “Rick’s Guide to Armenia” – will be published next spring. Meanwhile, we have the benefit of Rick’s massive research, presented for you here, with links to his website www.TACentral.com and a PDF version. Yerevan ԵՐԵՎԱՆ (DD 40.18340 x 44.50644, elev. 1009m, pop. approx. 1,000,000). Long a backwater in Armenian history Yerevan now weighs in as the economic powerhouse for the country, and its cultural, academic and scientific center, a bustling city of one million busy ‘Yerevantsis’ who always find time for a cup of coffee and to share an anecdote, advice and an opinion about the current events. The city is more than a capital, it has become the central point of the country, a magnet for the eight million Armenians living outside the country. This has made the city much more cosmopolitan than another city its size; Armenians from Buenos Aires, Marseilles, New Delhi and Moscow can be found next to others from Los Angeles, Australia and Beirut, each with their own unique take on life shaped by their experiences abroad, but all bound by one unifying idea; Armenia. Long scattered across the globe, Armenians have always brought the ideas and tastes of their new homelands to the old. The result is a sometimes bizarre, often startling, always eclectic mixture of tastes, ideas and art, unified by a shared history of loss and tragedy. Yerevan embodies this mixture in the houses it builds, the art it shows and the food it serves, with wonderful results. Spanish, Japanese and Armenian food sit side by side with French, Lebanese and pub grub in high-concept restaurants, trendy bars and hole-in-the-wall bistros. Yerevan’s cafes are caffeine palaces, built around fountains and flower beds and manicured lawns. Many have themes (Chalet, Old Rome, Retro 50s, the Stone Age) that defy descriptions. Along side your cup of coffee (still less than $1) is the right to sit and watch the world go by, something few cities offer. Armenians have so long had to prove their worth in their Diaspora countries they have developed an inordinate amount of talent, much of it on show in the mother city. Artists argue the merits of post modernism and expressionism as they display their work each weekend at Art Vernissage, an outdoor park, while ‘lesser’ handcraft artisans ply their woodwork, jewelry, weaving ceramic ware and embroidery on the other side of town at Old Vernissage, the largest Flea market in the Caucasus. More sophisticated work is displayed at one of a dozen galleries in the city. Actors perform in biting satires and Shakespearian tragedies considered among the best translations of the bard’s plays, while singers and dancers regularly recruited by European theatres perform operas and ballets n the large Opera House. Medieval music and folk dance is performed year round, and troubadours perform year round in theatres, concert halls and clubs. One of Europe’s best chamber orchestras gives concerts each weekend in Ring Park. Jazz, ethnic and rock music plays nightly, while the most respected Tango ensemble outside Argentina calls Yerevan home. No matter the skill, Armenians seem to always have someone who is a true master, close by. Interlaced with this internationalism is a totally provincial city that never quite got over its past as a garrison town in the Near East. Looking westward for a hundred years, Armenians have 6,000 years of being a part of Asia, and the mixture of the two is not always comfortable, while beguiling. Men hold hands to show affection, women entice with their clothes and makeup in almost shocking ways, while babulis (grandmas) dressed in grey and black hold down the family fort enforcing a strict code of ethics and morality. It is not always clear where the lines are, but over riding everything is the Armenian code of hospitality, which overwhelms many first timers. Yerevan is a city, with a city’s self-absorbed view, but it is also a collection of neighborhoods, ancient tribes and families, serious about their honor, also serious about how they treat guests. If you are invited to someone’s home for coffee, expect a table full of sweets and cakes along with that cup, and if asked for dinner, you will think the table might break under the weight of so much food. This is par for the course. Yerevan’s cultural treasures are many if not always well displayed. Museums include the world prominent Matenadaran, which protects 25,000 of Armenia’s most prized medieval manuscripts and miniatures, a must on your visit. There are more than 30 museums in Yerevan, from the State History Museum and National Gallery (the largest of their kind in the Caucasus) to Art, Literature, Music, Natural History museums. Museums include excavations, woodworking, craft, children’s art, film and literature, and the soon to open Cafesjian Museum of Modern Art, which will hold one of the most important collections of modern art in the world. The city also thrives on its new modernity, shaking off the shackles of Soviet conservatism for some openly celebrated hedonism. Don’t expect the excesses of Cannes or Lesbos (at least at regular venues), but you will be pleased at how cool the place can be, with discos, bars, clubs and cafés open all hours. Much of the night life doesn’t begin until 9 or 10 p.m. and can last til dawn. Like most ‘in-crowds’ it can be incestuous, but it is always fun for those who want it. The city is in the throes of enormous changes now, not just between Diaspora and local Armenians, but also between the old world and the new. Reflected by the destruction of historic neighborhoods and the new high rises dotting the landscapes is some serious soul searching about what kind of country Armenians really want. I have found even the most diehard hedonist to have real concerns of what they can expect in their lifetimes, and for their children. For most, Yerevan is the first stop on their visit. This is not necessarily a good thing, since the city is experiencing a number of growing pains, starting with a building boom that has turned this semi-desert city into one big construction site, with cranes, bulldozers and welders combing the rising structures of “New Yerevan”. Locals are unhappy to hostile about the whole thing, seeing entire old neighborhoods disappear so that developers can reap a quick profit. Never mind these neighborhoods were substandard and often lacked plumbing, or that in 20 years some of the new buildings will be hailed as “historic” structures not to be touched, Yerevantsi pride goes back thousands of years, and the new sits uncomfortably with memories of the old. If you come in the summer (most do), you may find the air thick and unpleasant. It is all due to the construction (Yerevan can pride itself on having the highest per capita use of Natural Gas for fueling its cars). Until construction ends the air will continue to wane between a gorgeous blue after hard rains and winter snows, and a hazy white. When clear, the amazing contour of Mt. Ararat looms over the entire city, dwarfing the tallest building. It is a tremendous thing of nature, and a melancholy reminder to Yerevantsis. Set inside present day Turkey, for thousands of years a part of historic Armenia and the symbol of the Armenian nation, the mountain is an untouchable dream, caught in glimpses and memories, shrouded in fog. So too, the Yerevan you may find. This is a city always on the brink, always reinventing itself. No matter how close you think you get to its pulse, t is enigmatic riddle that is its essence, the more unreachable it becomes, like the mountain in white air. Bravo To ArmeniaNow.com - Job Willllllll Don !!!! Tourism in Armenia has grown by an average of 25 percent a year since 2001, according to the Ministry of Trade and Economic Development. In 2007, data shows, 510,000 tourists visited Armenia, up 34 percent over the previous year. He says tourism development has boosted also the hotel construction and the number of hotels complying with international standards has grown. Official information says there are about 70 reliable hotels, with more than 10,000 beds. “People used to swim there (in the area of the Devil’s Bridge) and make barbecue. Now we have prepared a separate place for picnicking and have hired two villagers to guard the area,” says Manvelyan, mentioning such initiatives are aimed at promoting ecotourism. PanARMENIAN.Net - On December 24, Yerevan hosted opening of the first dolphinarium in Armenia. The dolphinarium is constructed by Nerum Ukrainian company. Four dolphins, two sea bears and a sea lion were brought to Yerevan from Odessa. “Tatevi tever” (“Tatev wings”) at the villages Halidzor and Tatev, Syuniq region -Spanning 5.7 kilometers across the spectacular Vorotan River Gorge, the Tatev Aerial Tramway - the longest passenger aerial tramway in the world. “Tatev wings” aerial tramway is supported by three towers between its two terminals. One terminal is on a hill overlooking the village of Halidzor and the other is near Tatev Monastery, on the road to Tatev village. At top speed, the tramway travels at 37 kilometers per hour and the ride takes approximately 11 minutes, with its deepest drop at 360 meters aboveground. Two cabins (each with the capacity to hold 25 people) operate at once, traveling in opposite directions. There are six cables altogether (three per cabin, with two cables suspending and one cable pulling each cabin), each uniquely built for the specifications of this project. They are capable of carrying 10-15 times more than the nominal load. The tramway is equipped with a diesel drive unit which will operate immediately in the case of a power outage. Shutov ampayman enqan nkar kdnem el chasats, hima der gortserovem @ngats! sorry folks it's in Russian for now!